Asher met Jason not long ago at his CrossFit L1 seminar. 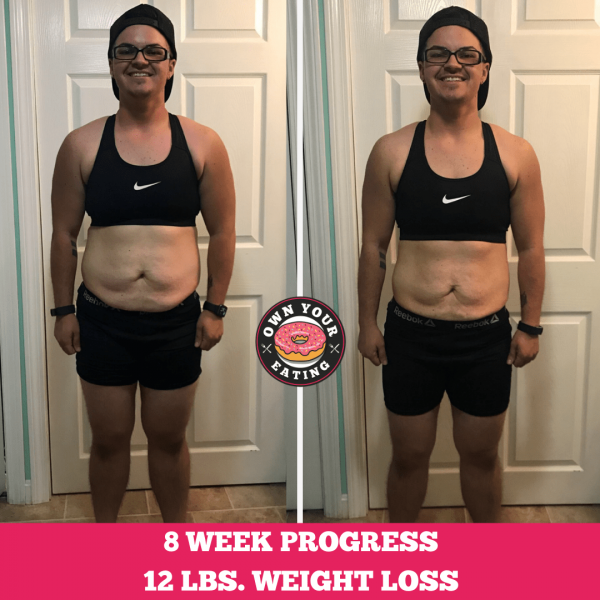 Asher started following Own Your Eating and inspired by all the progress he was seeing others out there make, he decided it was time to dial in his own nutrition too! Here’s what Asher has to say about his 8 week progress and 12 lbs. weight loss. I started flexible eating on September 5, 2018 with the Lifestyle Essential Monthly package. I saw other client transformations out there and read that they weren’t having to follow a strict diet. I wanted to get dialed in with my nutrition but knew it needed to be in a way that was sustainable for me. So far I’m down 12 lbs! I’ve lost inches around my waist. I feel lighter and a lot faster during workouts so I’m hitting new PRs almost every week! I’ve also noticed feeling less bloated. My biggest obstacle was binge eating on weekends. I’m still working on it but have gotten so much better with flexible dieting. It has showed me that I can eat basically whatever I want if it fits in my macros and has helped me tremendously. I would binge eat at least every Saturday and possibly Sunday. Since I’ve started this program – and I’m 8 weeks in now – I’ve only done it twice! I would not allow myself to really have anything I wanted during the week so all week if I ever wanted anything I waited till the weekend. I love anything chocolate and now I eat chocolate basically every day! It’s awesome! Not feeling deprived has made me so much more successful and has stopped me wanting to binge eat on the weekends. My advice to anyone starting would be to have patience and trust the process. It will work if you put in the work! Find out more about our team of coaches and what we can do for you with our lifestyle, nutrition coaching programs. Want to learn even more about nutrition, coaching and the business side of coaching? Then check out our certification program and our life coaching & business mentorship.